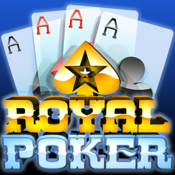 "Royal Poker" is a network game which can be connecting on the Smart Phone Users(iPhone, iPad, iPod Touch) and Computer online users simultaneously, and this game is compete between Game user and users, like general 7 or 8 Poker game. Maximum 5 gamers can playing in a same room together. This is the game to connecting with many online users, and playing together. - 2 to 5 players can be join in one game table together. - Can make or select game table for the different conditions(bet value, open cards and betting rule). - Can enjoy “Free Recharge Service” a day 5 times, if remaining under$1. - "Item Shop", can purchase game money for real betting condition. - The “Ranking system” is supported by the amount of the remaining credit. - Mobile and PC users can connecting and enjoying game simultaneously. It can be learned fast and becomes easy with few games into it, please enjoy with us.